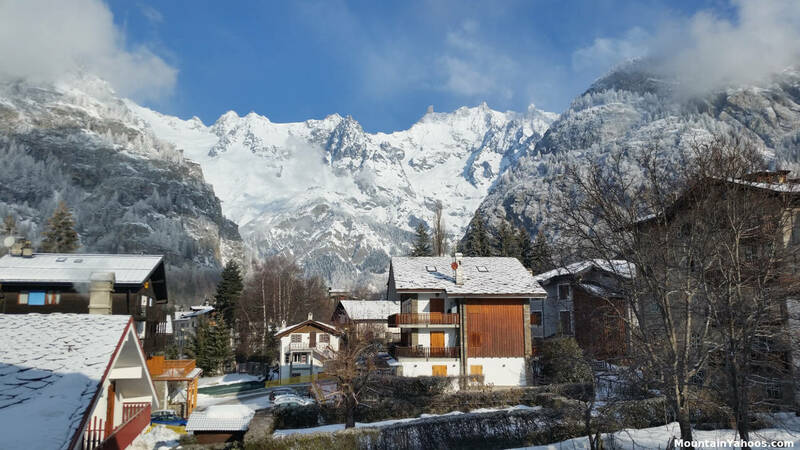 You may hear the Italians say the following about Courmayeur: "Venite per sciare, rimanete per i ristoranti" ("Come for the skiing, stay for the restaurants"). 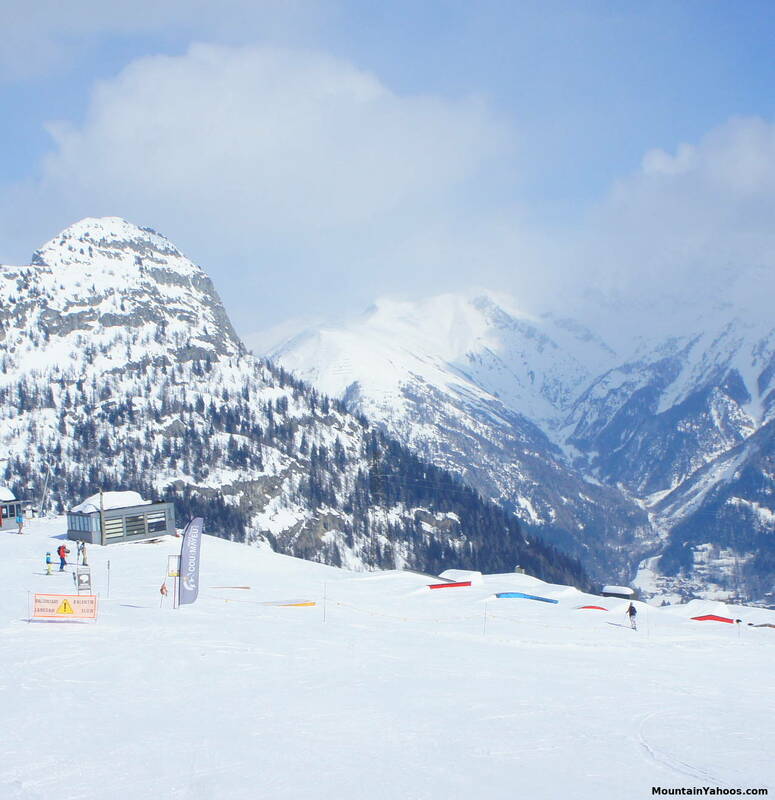 While the ski resort is very scenic and has a variety of runs, it is small by the standard set by other destination European resorts in the Alps. 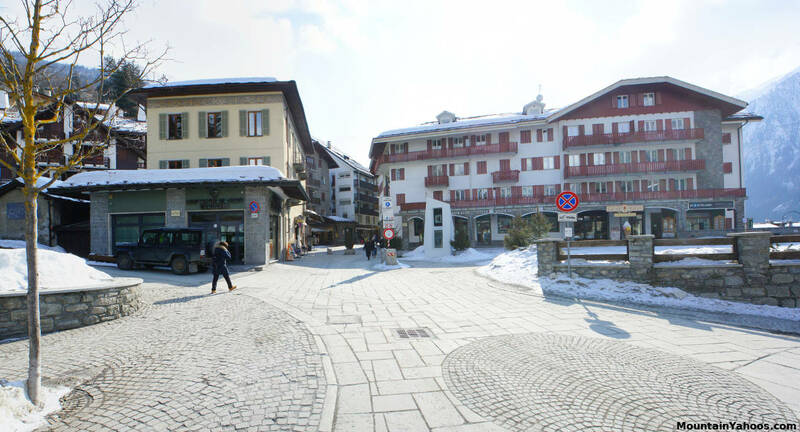 The town of Courmayeur is equally scenic with the full charm of an Italian ski village with cobble stone streets, stone and wood buildings and is small enough to stroll from one end to the other of the core downtown. It is complete with a variety of the finest restaurants complemented by upscale shopping along the car-free walk route, "Via Roma". The residential character of this ski town is comprised of charming alpine chalets. View looking down at the base of the resort with the town of Courmayeur in the distant valley below. 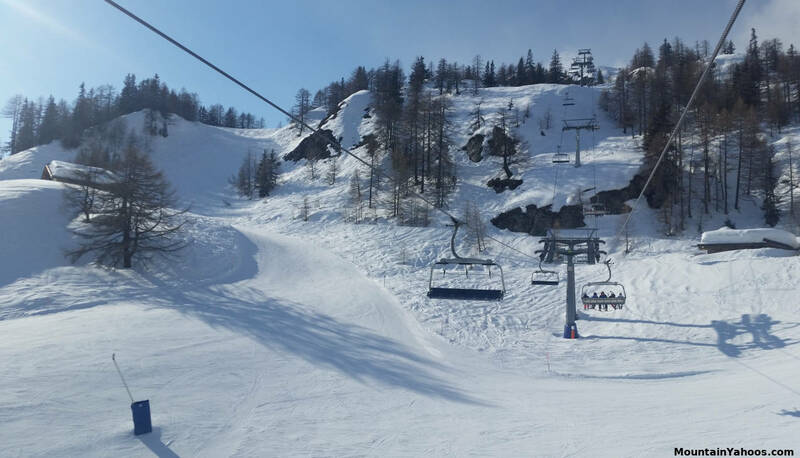 This mountain base is serviced by the two gondolas coming from the town of Courmayeur and Dolonne (operational till midnight). 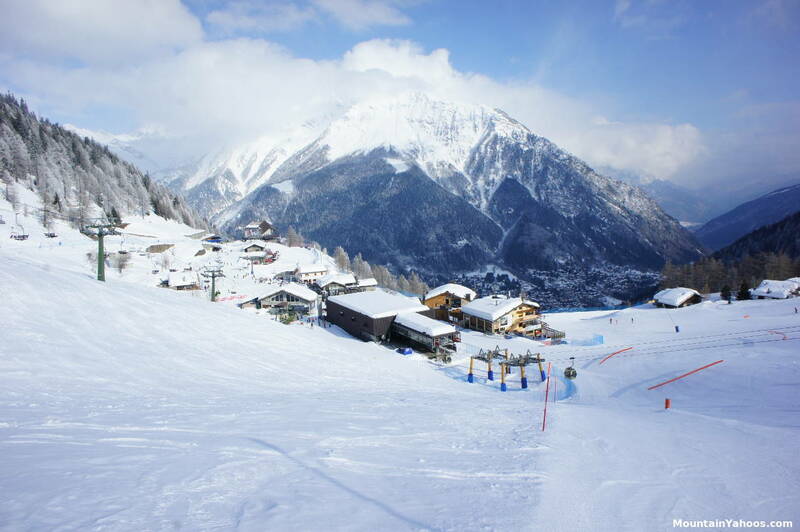 The Courmayeur ski area is above the town of Courmayeur Italy which lies on the floor of the valley. 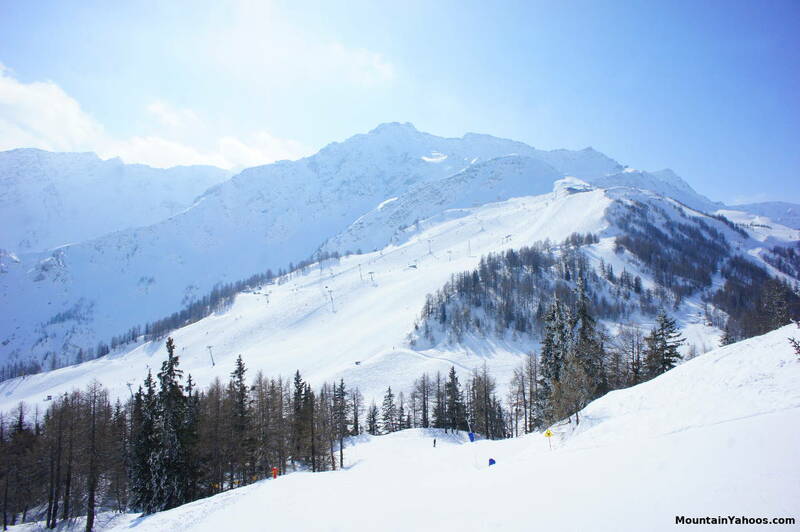 There are two trams and a gondola which can transport you from the floor of the valley to the base of the ski area from where one can take a multitude of lifts to ski runs at higher elevation. Courmayeur employs some automated robo-lifts with no attendants which use a conveyor belt to guide you to the chair automatically. 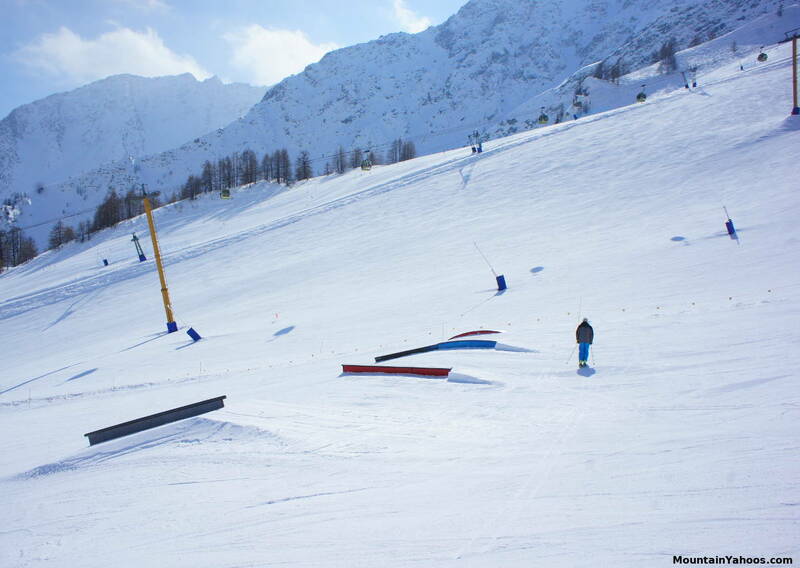 The vast majority of runs at Courmayeur are marked blue and red. 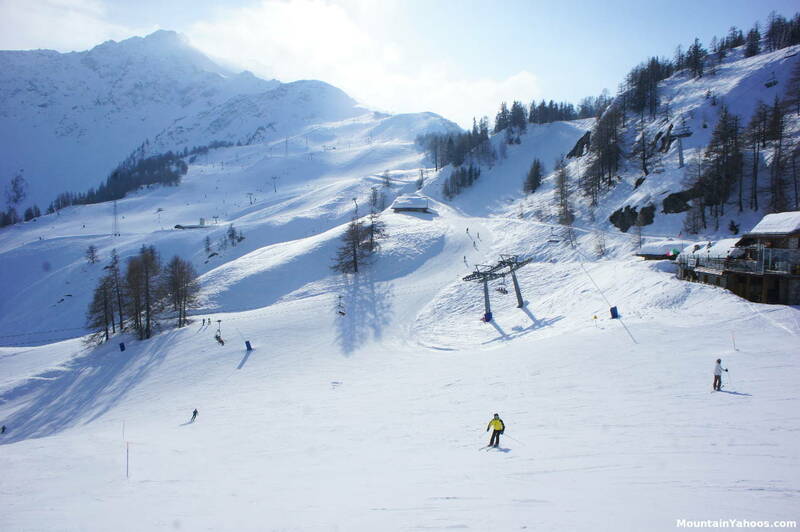 Courmayeur's self rating assessment lists no beginner terrain and rates the entire mountain as all intermediate or above. 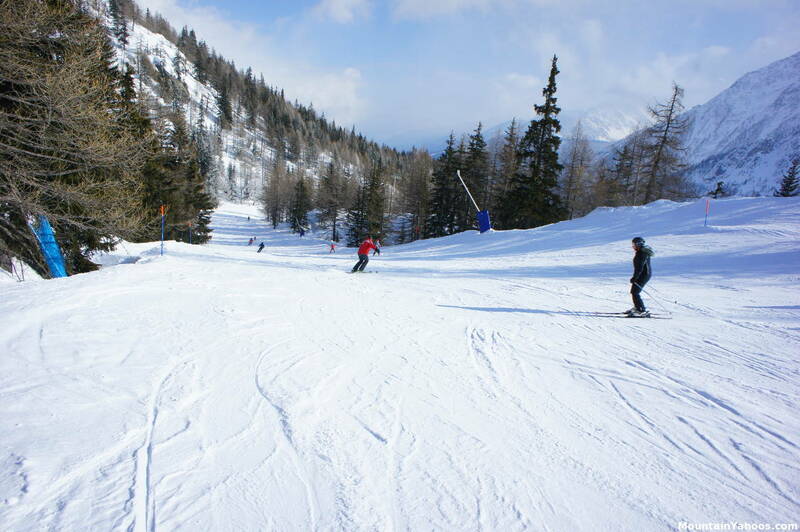 While it is true that there is only one rolling carpet lift with a short limited run for the first time skiers (at the peak of the "Val Veny" cable car), there is plenty of easy terrain for most beginners. The terrain is also very open and visible with few surprises. For those who are comfortable on skis but still want a gentle slope, they will find plenty of easy intermediate terrain. The trail map distinguishes "Black" runs as the advanced runs but they seem to be as groomed and easy as the intermediate runs. The challenging runs are the adjacent off trail routes through the trees. If you are looking for challenging runs, one must be creative. Under the "Dzeleuna" chair lift: If conditions are suitable, go off the groomed trail to ride the more advanced terrain under the lift line. Advanced terrain is often the applied creativity of the path chosen. Groomed trails are the easiest path to follow and may be required if the general conditions are crusty. Most of the resort is groomed and there was no area set aside to allow the formation of moguls. 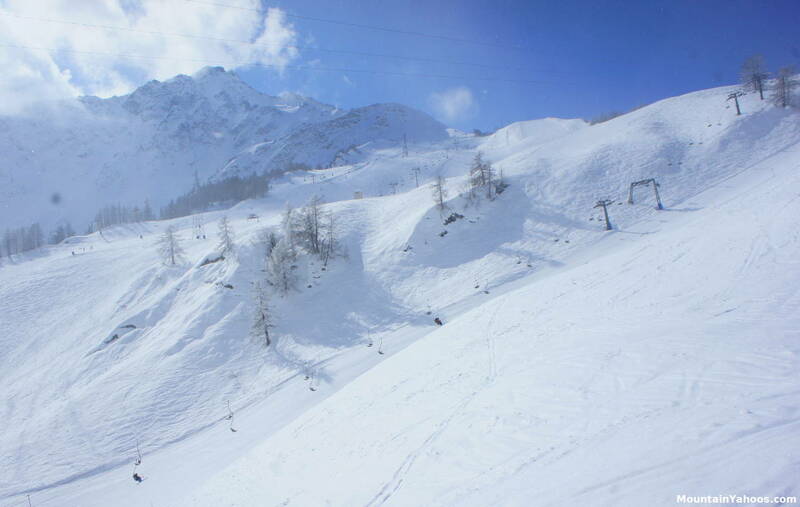 Powder is more often found at the upper elevations above the tree line. Trees were found to be spaced either too close together to ski or generously spacious. Snow conditions and coverage will dictate whether skiing a tree area is a good idea or not. Guided off-piste touring is readily available from the top of the Arp gondola at the peak of the mountain. Guides must be scheduled and reserved. Do not go without a guide especially in glaciated areas where crevasses are problematic (See this video). Heli-ski operators are also available. 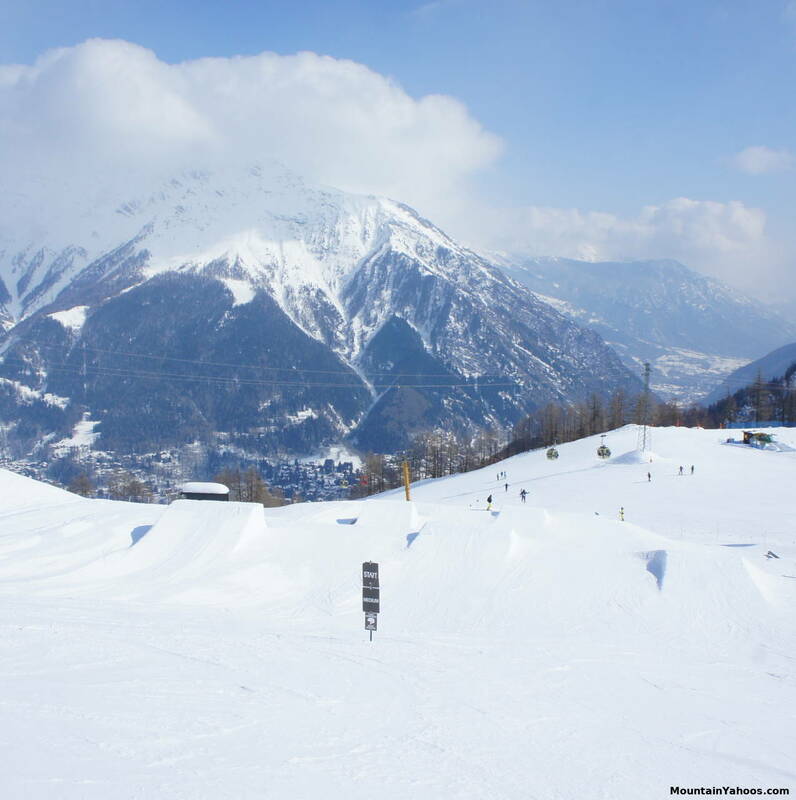 Courmayeur is not a destination resort known for terrain parks although it does have one and it is well marked on the trail map. The terrain park lies between the "Checkrouit" gondola and "Aretu" chair lift. Features are separated by skill level. The most advances are on the left, "Medium" in the middle and the easiest are on the rider's right hand side. The terrain park is comprised of rails, table tops and jumps for all skill levels. 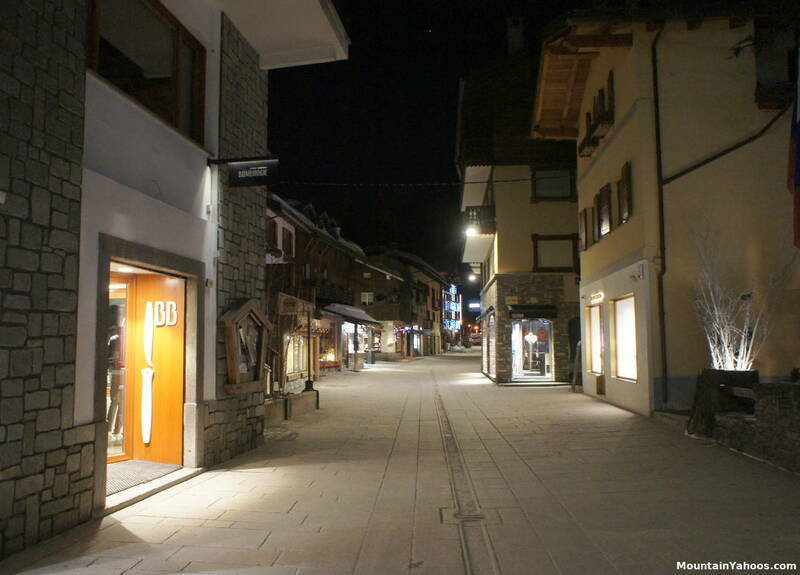 The walk street "Via Roma" in the town of Courmayeur is a Euro, upscale shopping destination on its own with fine shops and restaurants and ironic for a walk street, a Maserati dealership. The region has three dominant languages, Italian (of course, this is Italy), English and French. Your greeting initiates the language of choice. Say "Hello" if you want to speak English, "bon jour" for French and "ciao", "salve" or "buongiorno" for Italian. 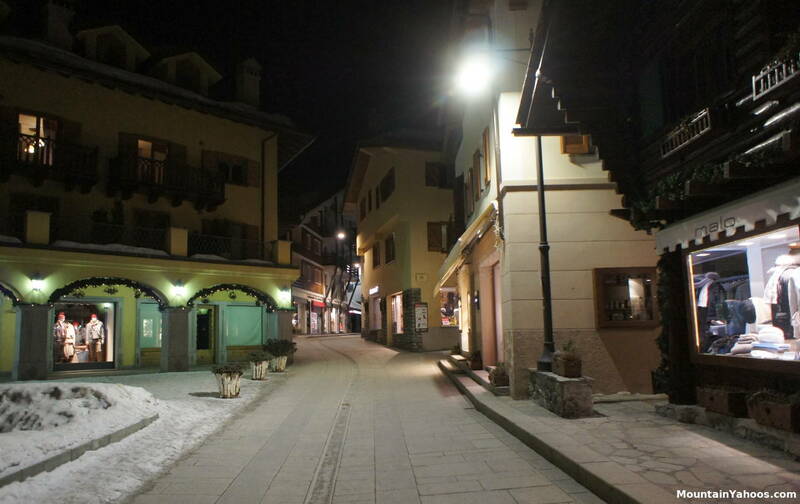 Town of Courmayeur Italy: The roads in Courmayeur are generally narrow and parking is very limited.